Chiara Bertan Disegnatrice e Fotografa, Drawer and Photographer: Get out of the charts!!! Get out of the charts!!! Ecco un altro disegno, sempre per un concorso in Belgio. Ho voluto rappresentare una persona che fuori dalla maschera, dai sistemi della società è ciò che lei desidera essere, ciò che è.
Mentre con la maschera lei è ciò che gli altri si aspettino che lei sia. Non è libera di esprimere se stessa, ecco perchè: Esci dagli schemi!!! Here is another drawing, always for a competition in Belgium. I wanted to represent a person outside the mask, from the systems of society is what she wants to be, what it is. 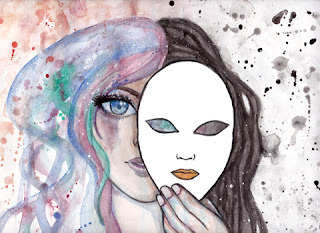 While with the mask she is what others expect her to be. It is not free to express herself, that's why: Get out of the charts !! !